I just love hackathons. For those who doesn’t know what a hackathons is, in short; Hackathon is usually a software developers gathering where teams and individuals create something from scratch before the hackathon ends. It usually lasts 12 to 24 hours. And why I love it so much? I learn something new each time I attend a hackathon; I set a goal to complete the project on time; and all that by hanging out with the like-minded people. Love it! My latest adventure was at the local’s 10 people (friends) hackathon, officially called HackWorks. Our lead hacker, Damir Sarcevic, had the best project, prepared the grill and fed us all :). I was working on a remake of the game my old game development team and I made, long ago. The game is CaveShip. Open it on you phone in landscape mode and touch the screen to keep the ship up from the gravity pull. If you still want it to try on your PC, press the UP key for the same effect. Game still doesn’t have any game rules like ship energy, level selection, a menu, etc.. I’m happy with the work done. Next time I’ll try something bit harder. I’ll try to create a remake of Speedy Lander, using Corona engine writing code in Lua. Wish me luck! After months of slow development, (we) GEM Studio finally released the refreshed game servers offer on a newly built website dedicated only to game servers. 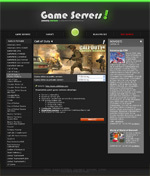 You can find news from gaming industry, administration for game servers and�child website klanovi.net for clans. I forgot to mention, this service is provided in cooperation with gameservers.com and only for Croatian and exyu�market. With the new website, we lowered the prices 40% on game slots. Other then that, now we�support 43 game titles and�ventrilo/teamspeak voice servers which are 50% cheaper when ordering along with the game server.